Kruno Spisic ( B.M. Technology, 1999) creates a new branch of gypsy jazz by fusing Eastern European folk traditions with Django swing. This new merging of sounds enthralls listeners with its sweet Balkan melodies, romantic songs and hot jazz. Kruno has performed at folk festivals all over the world and jazz clubs in United States, Canada, Europe and Japan, bringing his unique blend of swing and folk themes to exhilarated audiences. Krunoslav "Kruno" Spisic began his musical training at the age of 10. His first instrument was of Eastern European decent called the Tambura, a four tone mandolin from the Balkans. Growing up in a Croatian household, he was exposed to many forms of Tambura music from Eastern Europe and its gypsies. In his teens, Kruno took up the guitar and studied rock and blues throughout his high school years, honing his technical prowess and improvisational abilities. It was not until studying music at university that Kruno was introduced to jazz and Django Reinhardt-style guitar. Under the guidance of teachers such as Mark Koch, Bill Purse and Joe Negri, Kruno began a passionate study of the Gypsy Jazz genre. 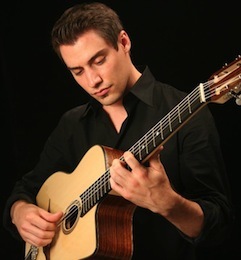 Kruno has played with French guitar greats such as Dorado Schmitt, Samson Schmitt, the late Patrick Saussois, Angelo Debarre and much more. Kruno has also recorded multiple CD's in the folk tambura genre as well as Gypsy Jazz CD's such as "Gypsy Jazz Guitar" and "Philadelphie sur Seine" with accordion great Ludovic Beier and Hammer Dulcimer master Alexandre Fedoriouk. He has composed music for short films such as "Folk!" and appeared in "Forbach for Ever" a documentary featuring French jazz musicians collaborating with American based guitarists during their tour in the United States.